She has children and grandchildren but the way she looks does little to give that away. 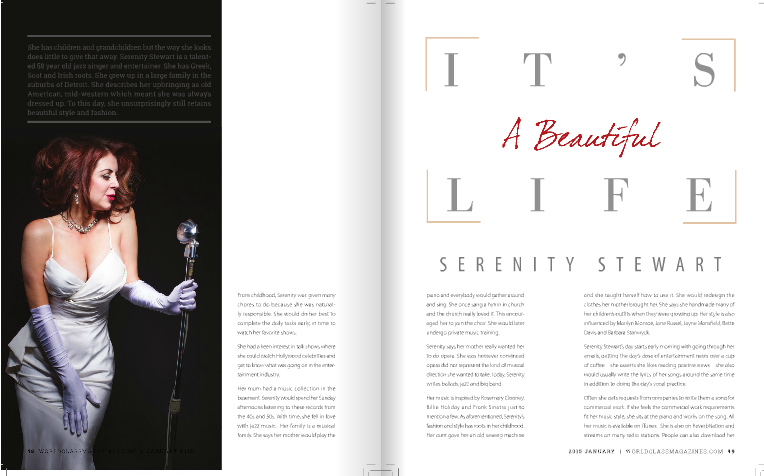 Serenity Stewart is a talented 58 year old jazz singer and entertainer. She has Greek, Scot and Irish roots. She grew up in a large family in the suburbs of Detroit. She describes her upbringing as old American, mid-western which meant she was always dressed up. To this day, she unsurprisingly still retains beautiful style and fashion. From childhood, she was given many chores to do because she was naturally responsible. She would do her best to complete the daily tasks early, in time to watch her favorite shows. She had a keen interest in talk shows where she could watch Hollywood celebrities and get to know what was going on in the entertainment industry. Her mum had a music collection in the basement. She would spend her Sunday afternoons listening to these records from the 40s and 50s. With time, she fell in love with jazz music. Her family is a musical family. She says her mother would play the piano and everybody would gather around and sing. She once sang a hymn in church and the church really loved it. This encouraged her to join the choir. She would later undergo private music training. She says her mother really wanted her to do opera. She was however convinced opera did not represent the kind of musical direction she wanted to take. Today, she writes ballads, jazz and big band. Her music is inspired by Rosemary Clooney, Billie Holiday and Frank Sinatra just to mention a few. As aforementioned, her fashion and style has roots in her childhood. Her aunt gave her an old sewing machine and she taught herself how to use it. She would redesign the clothes her mother brought her. She says she handmade many of her children’s outfits when they were growing up. Her style is also influenced by Marilyn Monroe, Jane Russel, Jayne Mansfield, Bette Davis and Barbara Stanwyck. Serenity Stewart’s day starts early morning with going through her emails, getting the day’s dose of entertainment news over a cup of coffee – she asserts she likes reading positive news – she also would usually write the lyrics of her songs around the same time in addition to doing the day’s vocal practice. Often she gets requests from companies to write them a song for commercial work. If she feels the commercial work requirements fit her music style, she sits at the piano and works on the song. All her music is available on iTunes. She is also on ReverbNation and streams on many radio stations. People can also download her music app to get easier and up-to-the-minute information about her music. While Serenity Stewart lives her life in full today, it was not always like this. It took a life-threatening experience to change her whole perception on life. In 2005, she bled out through the nose in what doctors believed was an artery that broke free. She did not think she would survive that experience. Miraculously, she did. After the experience, she stayed home for a few weeks to recover. Now, she is totally recovered and can even joke about it. Serenity Stewart advises women and girls to look at themselves in the most positive light possible. She says in a world where the media promotes certain looks, body sizes and figures, a woman must understand she is unique and different. “We were born perfect; why try to change that?” she asks. Serenity defines success as “how much I can give back and the priceless commodity of just being me”. She says she gets satisfaction in her music when she sings to an old person, a person in hospital or someone in a certain struggle and provides some kind of therapy and relief from their difficult circumstances through music. In the words of her friend, she says her ability to sing is only a gift if she gives it back. Otherwise, it remains just a talent.